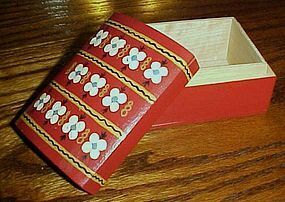 Sweet little jewelry casket box is hand painted red with white flowers. Curved top with tight fitting lid that lifts off. Extra nice condition with no damages or wear. Measures 3" x 4" and is 2 1/4" to the top of the curve. 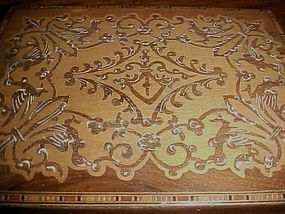 Inside is bare wood and in EXCELLENT condition. Original circular paper sticker says "At Home With Scandinavian Design". Sweet little wood box with tiny inlay of different woods create wonderful 6 point star pattern. Looks like a tiny quilt. 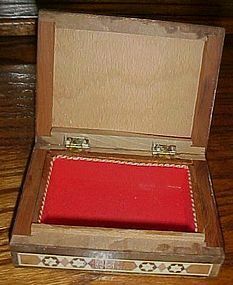 Box measures 5" tall x 3.75 x 4.75. Insic=de botom lined with red velvet. No chips or scratches, or missing mosaics. 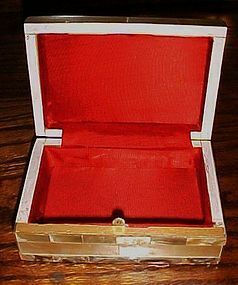 Lovely Wood Abalone and mother of pearl Shell Inlay Keepsake Jewelry Box with red satin -like lining. Intricate ornate abalone and mother of pearl shell inlay with a carved star center. Overall dimensions: 2" H x 3.5" L x 5.25” W. Excellent Used Condition. A great gift for someone special! 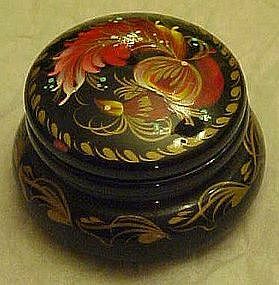 Ornate hand painted pill box is made of wood and has a laquer finish inside and out. Excellent condition! Designs make me think it is made in Mexico. Measures just 1 1/4" tall. 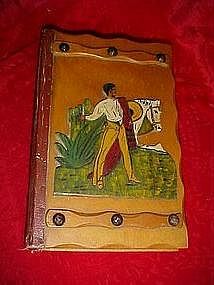 A nice wood box made to look like a fake book. When you open the lid you can place your valuables inside. I think this one was meant to lay on a table or shelf because of the carving of the Mexican Man and his horse on the front. Wood strap design with brad studs. Measurement is 6" x 9" and is 2" deep. Faux leather canvas backing on the spine.